FC Barcelona needed a late goal from Lionel Messi to see off a very determined Malaga side at the Camp Nou. The scoreline could give an impression of a close encounter, but it never was. Barca was dominating all around the match and Malaga was hell bound not to concede a goal. A sensational strike from Pedro in the 68th minute broke the deadlock. But Valdo equalised in the 80th minute threatening to spoil Barca's night, but an 84th minute Lionel Messi strike gave us a very well deserving victory. Real Madrid earlier moved to the top with a 5-1 thrashing of Tenerife, that should have provided enough motivation for the players to work tirelessly to retain the top spot. Guardiola used a different formation in this match with Iniesta playing in the front left, Pedro on the right and Messi playing behind Ibrahmovic. Xavi and Busquets played in the midfield. The defense saw Alves coming back from injury, Pique and Puyol formed the central defense and Maxwell positioned himself in the left back position. Why Barca Defense is struggling? Now, this seems to be the question in everyones mind nowadays. FC Barcelona has been uncharacteristically sloppy in their recent games, especially their defense. A look at the stats may give a sense of re-assuring to Barca fans, but the stats not always tell the true story. In the last eight games we have conceded four goals with winning six, drawing and losing one each. Now in a normal scenario this should be considered as a very good defensive record. But a closer look shows that we have conceded four in last four games while scoring eight goals, still a very good record many would argue. But for the fellows who has been watching Barca defense's recent performance these stats are of no comfort. Against Racing our defense had a good night but the problem performance came against Atletico Madrid and Stutgart yesterday. Our defense were constantly bombarded by waves of attacks by these two teams, something which rarely happens with Barca. Barca survived an absolute onslaught from Stuttgart and came out with an un-deserving 1-1 draw. The crucial away goal could prove to be very crucial in the second leg for Barca. 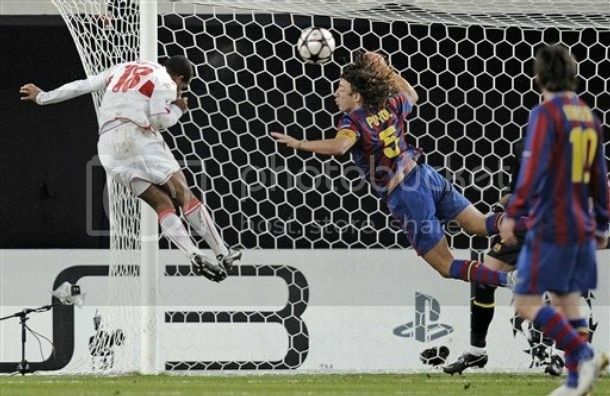 Cacau put Stuttgart ahead in the first half but Ibrahmovic equalised for Barca in the early second half. Johan Cryuff has described FC Barcelona's performance in last match as their worst, he should have waited till this match. This was the worst Barca Performance for last three or four season. I cannot remember a match were we were so hopelessly over-run by the opponents. We looked like a second division team in the first half, but did well in the second half. We were up against the German efficiency which we usually associate with their national team, and failed miserably to stamp our authority. Guardiola chose Marquez and Pique to be in the defense, Puyol and Maxwell played the full back roles. The midfield was made up of Toure, Busquets and Xavi. The front line had Iniesta, Ibra and Messi. Barca's Champions League campaign re-starts after the long vacation with a visit to Stuttgart on Tuesday. On the back of winning their group Barca will have the luxury of playing their second leg at home. Barca's recent injury worries has been a problem into the build up of this game. But it looks like Barca's injury problems are finally easing up. Xavi and Alves has been included in the team which makes the trip to Germany, despite not getting the final OK from Medical staff. The squad list is Valdés, Pinto, Puyol, Maxwell, Piqué, Milito, Txigrinski, Touré, Sergio, Xavi, Iniesta, Bartra, Jonathan, Jeffren, Messi, Bojan, Pedro, Alves, Ibrahimovic and Henry. It is highly unlikely we will see both of them starting the match. Barca should be in high spirits with a 4-0 victory against Racing Santander. It is not yet clear whether Ibrahmovic is deemed fit for the Stuttgart match after missing out last match due to a ankle injury. Meanwhile Barca's opponent Stuttgart has their own injury problems. 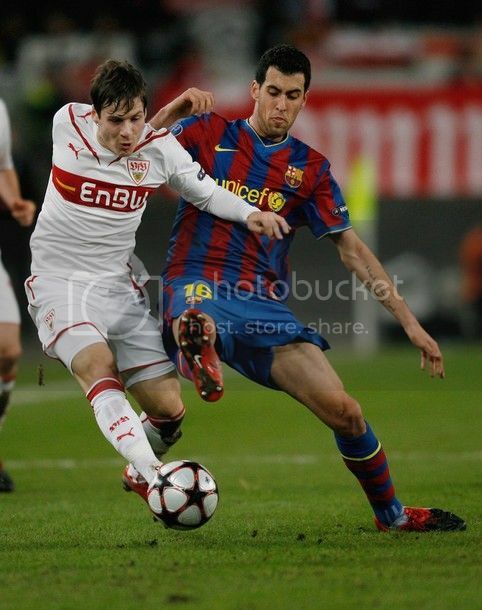 Stuttgart Left Back, Arthur Boka will be missing FC Barcelona tie after damaging his shoulder against FC Koln. Highlights from FC Barcelona's victory against Racing santander on 20/02/2010. FC Barcelona bounced back from their dissappointing defeat of last week with a spectacular 4-0 victory against Racing Santander. With this victory we have managed to extend the lead on top to five points. Real Madrid who will play Villareal at home has a chance to reduce the lead tonight. First half goals from Andres Iniesta, Henry, Marquez and a second half goal by substitute Thiago Alcantara helped Barca to a very comfortable win. FC Barcelona's performance came on the back of all recent injury troubles and this victory would have put the team in great frame of mind for the Champions League encounter against Stuttgart. As I said in the preview, this was Guardiola's 100th official match in charge of Barca and his players celebrated it in the right way. Guardiola Puyol, Pique, Marquez and Maxwell in defense infront of custodian Valdes. The midfield ghhad Toure, Busquets and Iniesta. The frontline had the regulars Messi and Henry , meanwhile Bojan got a rare start as Ibrahmovic was left out as a precaution to an ankle injury. Racing Santander's visit to Camp Nou has become a test for this FC Barcelona side coping with a series of injury problem. FC Barcelona's success in 2009 was helped by the fact that none of our major players had long injury lay off. But this season tends to be different. The list of injured or just recoverd from injury is stunning. Out of FC Barcelona defenders currently Alves and Abidal are injured meanwhile Chygrynskiy has just returned from injury. In the Barca Midfield we will be missing Xavi; Toure has returned back to training. The match against Racing Santender brings some personal milestone achievement for Guardiola. 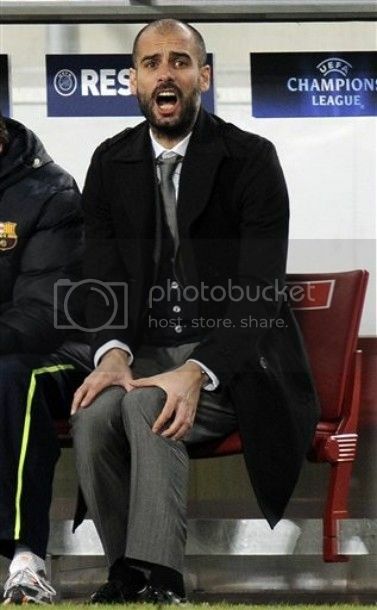 This will be Guardiola's 100th official game in charge as Coach of FC Barcelona. In the 99 matches he has manage to win 70, draw 19 and had ten defeats; and don't forget the six trophies he won us. That's one hell of a resume. Barca's opponent Racing is lying in the 14th position and in usual scenario should have been an easy opponent. Earlier this season when the two teams met at El Sardinero stadium, Barca emerged comfortable victors romping home 1-4. But FC Barcelona's injury cricisi may tempt Racing to come out blazing and look for a rare win at Campo Nou. Ex-Barca superstar Ronaldinho looks like to have resurrected his career at Ac Milan finally. The Ronaldinho Show that was put up against Manchester United shows that it is too early to write off Ronaldinho, the two time World Player of The Year. Ronaldinho's fall from the top was much faster than his ascent. His wayward life-style and sudden drop of passion towards football, took this Superstar in a downward spiral. After two disaster at Barca following three seasons of Ronaldinho magic, Guardiola packed him off to AC Milan. It was the right thing for Guardiola and Laporta to do. He has lost his passion for the game and that was showing heavily in Barca's game. But the question at that point was whether Milan was foolish to buy him from FC Barcelona. At 21 million Euros, Ronaldinho came much cheaper but it was not clear whether he will be able to hit back to his normal form. Finally some good news for FC Barcelona fans - Barca Players Yaya Toure and Dmytro Chygrynskiy both have returned to full training with the rest of the squad. It would be music to every Barca fans ears, especially the return of Yaya Toure. On Wednesday the duo trainied in isolation, but today they joined with their team mates for warm up and drills. Now that simply means both are back almost fit. Toure most probably will start against Racing if he is declared fit. Barca were facing a shortage of fit midfielders and this is all good news for Guardiola. FC Barcelona's current injury crisis has shifted from the defense to Midfield. Keita has been already ruled out for three to four weeks, now it has been confirmed that FC Barcelona will be without the service of Xavi Hernandez for two weeks. Xavi has picked up a knock in the Sunday's game. Tests conducted on Monday have revealed that the player has torn semitendinosus muscle fibres in his right thigh. He will be out for about 15 days.If you can't take that, then consider this - Busquets is suspended for the Racing match. Now on Sunday we had only three regular defenders available, now it looks like we have only one midfielder available for next match. Guardiola's problem in defense is set to be solved as Pique and Marquez will be back from suspension. Dani Alves, Toure and Abidal are already out with injury. Barca were handed their first defeat of the League this seasonat the Vicente Calederon by Atletico Madrid. Our last three visits to Vicente Calederon has ended in defeats, and this stadium is quickly becoming a nightmare for every Barca fan and player. 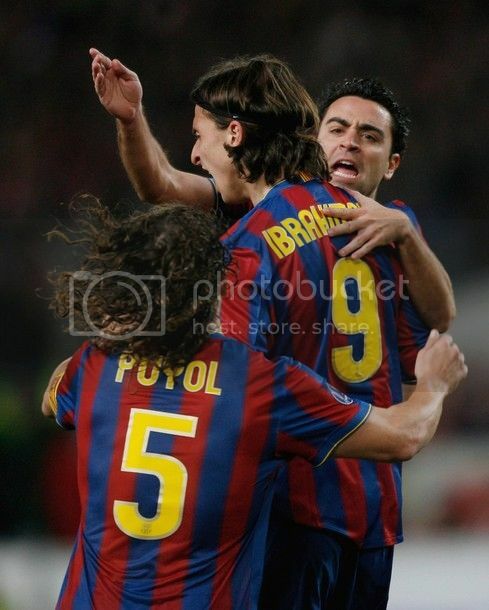 Two early goals from Forlan and Simao were enough for Atletico Madrid eventhough Ibrahmovic pulled one back for Barca. Barca's night was made more terrible by Keita's harmstring injury. He is expected to be out of the game for four weeks. Guardiola with all his problems at defense decided to start with Jeffren at the Right Back position. Puyol, Milito and Maxwell started at their usual position. Barca midfield included Xavi, Keita and Busquets. The front three had Iniesta, Ibrahmovic and Messi. FC Barcelona is going into this match with a mere two point lead at the top of League. Real Madrid, yesterday with a convincing 3-0 victory against Xerex cut Barca's lead at the top to two points. So the immediate attension of our players will be to restore the lead to five points, despite of all the absentees in defense. FC Barcelona will be missing Marquez and Pique through suspension, meanwhile Toure, Alves, Abidal and Chygrynskiy all are missing through injury. That leaves only three defenders in the squad - Milito, Puyol and Maxwell. It also raises the question about the formation we would play in this match. There have been suggestions about playing a 3-4-3 formation. A 3-4-3 formation with a pure full back, Maxwell could be disastrous at Vicente Calderón. Guardiola has already called upon three Barca Atletic players, Jonathan, Muniesa and Bartra into the squad. Jeffren is finally back from injury and could find a place in the team as he has earlier played the Right Back in Barca's match against Cultural Leonesa. The squad list for the visit to Vicente Calederon is Valdés, Pinto, Bartra, Muniesa, Maxwell, Puyol, Milito, Keita, Xavi, Iniesta, Busquets, Jonathan, Ibrahimovic, Pedro, Bojan, Jeffren, Messi and Henry. The nomination list for the prestigious Laureus award, often referred as the OSCAR of Sports has been revealed. FC Barcelona and Lionel Messi has made into the final five nomination for their respective category. Lionel Messi is nominated for the Laureus World Sportsman of the Year Award along with last year's winner Usain Bolt, four time winner Roger Federer, long distance runner Kenenisa Bekele, Tour de France winner Alberto Contador and MotoGP champion Valentino Rossi. FC Barcelona has been nominated for the Laureus World Team of the Year Award along with Los Angeles Lakers, New York Yankees, Germany Women's Football Team, Brawn Formula One and the South Africa Rugby Team. The nominees for Laureus World Sportswoman of the Year Award are Serena Williams, Federica Pellegrini, Britta Steffen, Sanya Richards and Lindsey Vonn. Current Bundesliga Champion Wolfsburg has been nominated in the Laureus World Breakthrough of the Year. In 2006 FC Barcelona has won the Spirit of Sport Award. Guardiola's defensive problems are increasing by the minute. Now Chygrynskiy is out for a week with a slight thigh problem. Chygrynskiy noticed some discomfort in his left thigh in training, the scans revealed a 1.5cm tear. Now with that we have almost all of our defensive players in the squad in the injury list. Plus both Marquez and Pique both are suspended. Now the only option left to Guardiola is to use Keita at left back, Puyol and Milito in defense and Maxwell at right. Another option is to have Muniesa or Fontas as Centre defender and use Puyol as Right Back. But against the likes of Forlan and Aguero that could be suicidal. Barcelona based Sports daily Sport and MundoDeportivo both has reported a story about FC Barcelona and Cesc Fabregas reaching an agreement about the players transfer. Joan Laporta, before his tenure expires is expected to bring the Catalan star back to the club. There were reports emerging from England about Arsenal writing to FC Barcelona to stop pursuing their Captain in public. Now the club has to negotiate with Arsenal for the players transfer in the summer. Arsenal is reported to be offering Cesc an improved deal which will see him becoming one of the highest earners in English football. Nobody knows which story is true and we may have to wait till the end of this summer to get an answer. Cesc Fabregas is reported to be increasingly frustrated about the lack of silverware at Arsenal. Guardiola will have some sleeples night after his preferred left-back Abidal has been ruled out of action for two months due to a thigh injury. Already Barca will be missing Alves, Toure due to injury and Pique and Marquez due to suspension in Sunday's visit to Atletico Madrid. This put Guardiola in a very tight spot as he has to organise the defense with Milito, Puyol, Chygrynskiy and Maxwell. The injury come to Abidal in a very unfortunate time as he has been in excellent form recently. Maxwell's performance last week at Right back gave an assurance that we may not be missing Alves that much. Now it's all back to square one. Iniesta also returned early from training after suffering a knock on his leg, but the club assured that it was a precautionary step. Marc Bartra and Andreu Fontas from Barca Atletic has been called up as cover for the injuries. FC Barcelona continued their excellent winning form with a well fought 2-1 victory against Getafe. Barca looked to have total control of the game followed by Lionel Messi goal in the 7th minute, but a red-card for Pique changed the entire game. In the end it was a test for the resolve of this team and they came through in flying colours. But this victory came with his share of problems for Barca. Pique could be missing in action in the next match. Toure who was injured looks like he will miss the game for almost two weeks. Dani Alves, who has aggrevated his injury is now set to miss three weeks of action. With Alves and Puyol missing, Guardiola slotted Maxwell at Right back, who looked excellent in that position. Milito started in the league after a long time along with Pique and Abidal in defense. Xavi, Toure and Keita formed the midfield. Toure was also given a rare start in league by Guardiola. The front line featured Iniesta, Ibra and Messi. The league gets back o its normal ways again tonight. Barca will try to increase their lead to put pressure on Real Madrid who plays after our match. Getafe lies in the 7th position and will offer a tough challenge for Barca, who will be missing their captain Puyol through suspension. 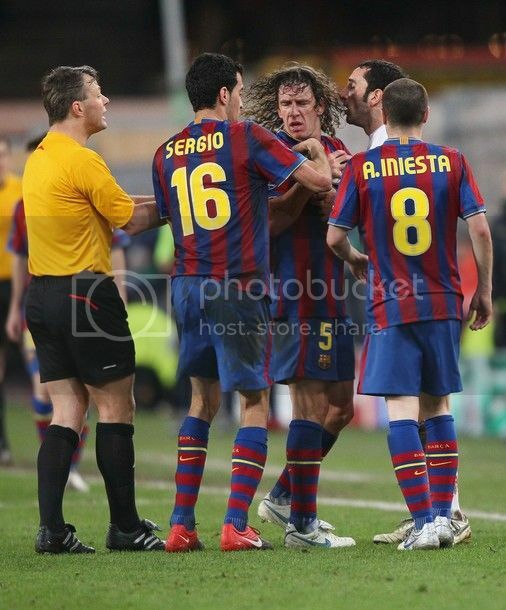 Barca has lost twice this season and in both those matches we miss Puyol badly. There are certain selection scenarios ahead for Guardiola, but the most anticipated of them will be who will play the defensive midfielder role. I already has resigned to the fact of Toure being forced out of the club in summer so I don't expect Guardiola to pick him. Dani Alves has returned back from injury and should start in this match against Getafe. last season getafe were one of the few teams who escaped from Camp Nou with a draw. Barcelona has struggled against Getafe in recent competitions, so thsi is going to be a very tough challenge for this Barca side. Cesc Fabregas or David Silva? Cesc Fabregas, David Silva and Frank Ribery are three players who are constantly being linked as Barca's Summer transfer targets. Of this Fabregas rule the list, with the each Presedential candidates promising his signing. Don't go too far with Presedential candidates' rhetoric. Laporta became president promising signature of David Beckham (for what I don't know!) but luckily managed to sign Ronaldinho. So Fabregas might be leading the line, but it may even not take place. As far as Ribery is concerned, he could be a risky signing as he has a history with injuries. So I am discounting him from this discussion. Fabregas and David Silav form the integral part of Spain's National squad. Because of the abundance of talent both of them sometimes struggle to find a place in starting eleven. But there is no denial that they are the best in their respective positions. Cesc Fabregas evokes more emotions at Barcelona and everyone want this product of their youth academy to return back to his roots. David Silva has spend his all career at Valencia apart from loan stints to Celta Vigo and Eibar. Bojan Krkic has recently indicated via media an urge to stay in Barca and fight for a spot in the Barcelona forward line-up. His decision is most probably made up on the fact that no concrete offers came in for his loan in the winter transfer window. But it is yet to be seen whether he intend to stay in Barcelona the next season. Bojan Krkic was the next big thing after Messi from Barca's youth academy. His debut season was sensational but the last two season, Bojan have been finding it difficult to see enough playing time. To his discredit he has not done justice to the opportunities given to him. But then it is harsh judging him by his performance in these matches as the opportunities come very few and far in between. If Ibrahmovic has not yet regained his form after playing game after game, Bojan will never hit any kind of form with playing time of ten minutes per month. From an outside perspective Bojan's situation is not bad, actually many would die to be in his position. Taking the position of centre forward into consideration, he is the only real alternative for Ibrahmovic in the team. And that simply means he should get enough playing time , but that's not the case with Bojan.